Set of 4 color screen prints on heavy white paper, full margins. Robert Indiana (* 13. September 1928 in New Castle, Indiana; ursprünglich Robert Clark; † 19. Mai 2018 in Vinalhaven, Maine) war ein US-amerikanischer Maler sowie ein Hauptvertreter der Pop Art und der Signalkunst. 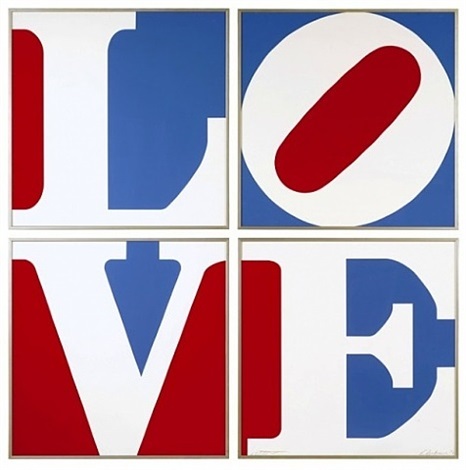 Robert Indiana (born as Robert Clark; September 13, 1928 – May 19, 2018) was an American artist. He was known for being a part of the pop art movement. He was born in New Castle, Indiana. Indiana moved to New York City in 1954 and joined the pop art movement. Indiana's work often has bold, simple, iconic images, especially numbers and short words like "EAT", "HUG", and "LOVE". His sculpture in the lobby of Taipei 101, called 1-0 (2002, aluminum), uses multicolored numbers. Robert Clark (New Castle, Indiana; 13 de septiembre de 1928-Vinalhaven, Maine; 19 de mayo de 2018), más conocido como Robert Indiana, fue un diseñador de vestuario, pintor, escultor y diseñador de estampillas estadounidense asociado con el movimiento pop art. De todas sus obras, las más conocidas son las series realizadas con la palabra LOVE. Indiana también ha trabajado diseñando escenografías y vestuario para obras teatrales.